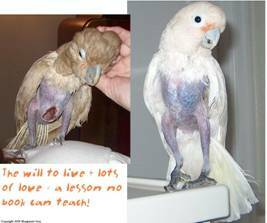 I received a call from Mickaboo in July 2003 about a Goffins Cockatoo who had been delivered to San Francisco Animal Care & Control. The little bird had apparently been rescued from a home in which she was not well cared for. She was found in a small cage also containing a cockatiel. The owner had apparently died in the house several days prior and the birds were left alone until the body was discovered. She was in such bad shape that the shelter's vet was going to put her down if I didn't get her within the hour. I hightailed it to the shelter and found a filthy, skinny, plucked, pathetic little parrot with a huge infected self-mutilation wound in her chest. I took her home with me and left a message for my vet that I had a bird needing immediate attention the next day. I took her out of the carrier; she immediately ran up to my shoulder and, in a scratchy voice, announced "Pretty Birdie!" I knew then and there that I'd do all I could to save and keep this little survivor. We carefully washed her and found a little white bird under the grease and dirt! We named her Artie. She ended up needing surgery to repair the wound. Mickaboo arranged for the surgery and footed the bill. After a long recovery period and lots of patience and coaxing, she flourished. Artie still has some medical challenges, but today she's a happy bundle of energy that can't be stopped. I love her dearly. PS – The cockatiel also survived. The vet said it was a miracle that he did, with a larger, starving bird in the same cage - a testament to Artie’s kind disposition. 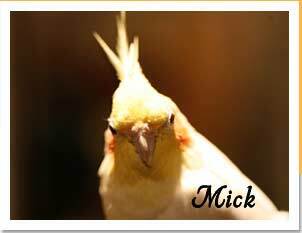 The cockatiel was also adopted out by Mickaboo. Another success story!